Handbrake cables - How to adjust. 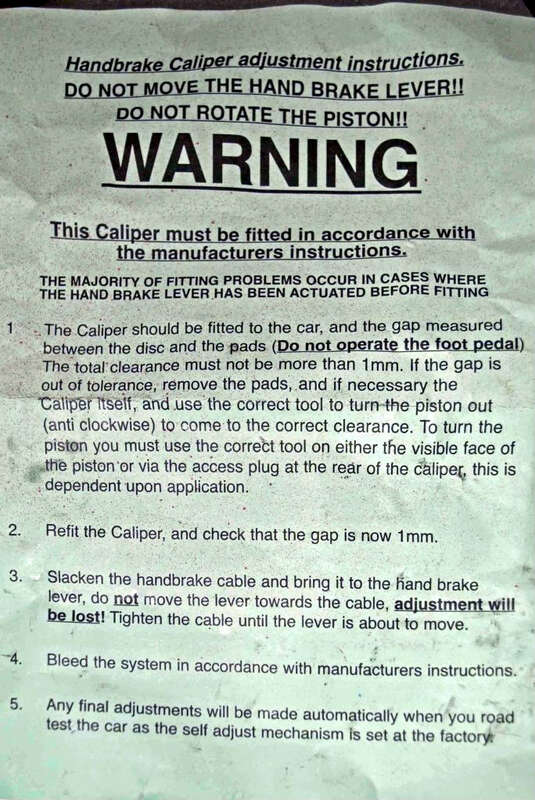 When I fitted new rear calipers, these instructions were useful in setting up the handbrake properly. They could be utilised, after fitting new pads, or to correctly adjust the cables. N.B. You can wind out the piston effectively with long-nosed pliers, rather than buy the special tool. Once this adjustment has been completed, if the handbrake lever in the cabin is loose, you can adjust the slack by removing the centre cubby box. There is an adjuster nut under it, adjust until the lever returns to the rest position and the warning light stays off. If after this you have a flickering brake light consult this:- HOW TO . david aiketgate wrote: Once this adjustment has been completed, if the handbrake lever in the cabin is loose, you can adjust the slack by removing the centre cubby box. There is an adjuster nut under it, adjust until the lever returns to the rest position and the warning light stays off. If after this you have a flickering brake light consult this:- HOW TO . When taking up the slack with the adjuster nut, it is vital that you don't overtighten it such that you pull the calliper levers away from their stops. Or the handbrake will not operate correctly.